Because Buddy is in such bad shape, instead of going for something really heavy duty right now, the oncologist started Buddy on a stronger form of the same chemo he’s already on. If he does well, we’ll move up to a more powerful drug. I should start seeing results in three days. Because it’s a similar chemo it might not do anything. If it doesn’t then that’s that, because the oncologist doesn’t think he can tolerate anything else at this point. The oncologist also wanted to hospitalize Buddy for two days to give him iv fluids, and I passed on that and will instead give him sub-q fluids at home. It’s not ideal, but hospitalizing him was another level of misery I couldn’t heap on Buddy and the doctor said he couldn’t guarantee it would make much of a difference. Buddy also needs a lot of meds and he has to eat whether he wants to or not, but I can manage all of that. I’m glad I’m doing this. I still feel sick and stressed, but I also have just a slight feeling of being at peace, from making sure I’m doing what I can without going overboard and causing him more distress. So far nothing I’m doing is overly hard on him, except for the vet trip, which is not horrible. 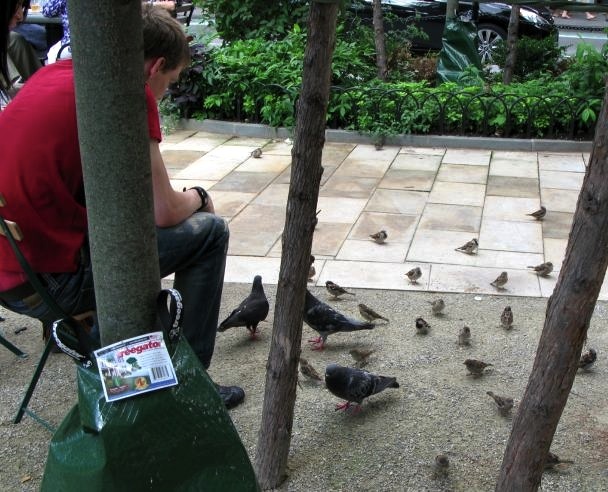 A nice young man feeding birds across the street from The Kills book signing yesterday. Go Buddy! I hope there are encouraging results from the new drug! We’re all pulling for you. I’ve always felt that when any of my cats were really ill, the last thing they needed was the stressful environment of hospitalization if it could reasonably be avoided. My kitties and I have our fingers and paws crossed for Buddy…that he responds to the new dosage of his meds and eats and drinks lots! Thanks for saying that. The doctor sent a follow-up report in writing, saying that he recommended hospitalization and I declined, but I am still comfortable with my decision. The only thing they can do that I can’t is IV fluids, and the sub-q should be fine. Even in his report he said Buddy was reasonably hydrated. Yes, Buddy is much better off home with you. If I had a sick cat, I’d send him to you instead of a hospital! Thinking of you both and hoping for some positive results in a few days. Home is where I want to be when I’m sick. Sweet little Buddy knows that when he’s home, he’s surrounded by love. Nothing’s more powerful than Vitamin L.
I hope you and Buddy and Finney can get some sleep. Mothers of Cats need rest, too. Saying prayers for Buddy! Thank you everyone for your words. Today is hard. He seems worse to me, but the oncologist said people often report lethargy the day after chemo. Chemo is tough for man or beast (don’t take offence, Buddy) hang in there,stacy. Just to let you know that I’m thinking of you and your dear Buddy boy today. He and Finney are so blessed to have such a loving and nurturing “mom”. As Vivian commented above, “nothing is more powerful than Vitamin L” and you’re certainly providing that. I’m checking updates for news on little Buddy — hope the meds have given you both a little peace of mind and spirit. Breathing room, too. Thank you thank you thank you for all your kind thoughts. It’s nice to know people understand how intense this bond can be.